In the well thought of info sheet that shared the confined space of the envelope with the album itself, the members of Devianz mentioned, among other extensive information, that their sound resembles, in a way the sound of the band At the drive in. I stood there, suspicious, because I am not a fan of the mentioned band, but I knew this is not going to be a reason not to give this album a listen. Indeed, the dramatic and bombastic at times elements of the furious rock music that can be found in the music of At the drive in have some grasp in the music of ‘A corps interrompus’. However I am more interested in a different angle that is revealed in the essence of the music played in these fourteen tracks. This band has a touch to its sound which makes it a little more naïve and a lot more sincere. While I cannot personally relate to this kind of music, this sincerity catches my attention as I listen to “L’alchimie des sens” and appreciate the pain that takes shape in the music. 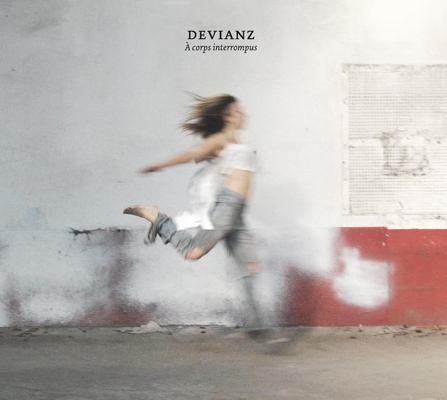 I can also appreciate the musical ability of the five members of Devianz and their ability to turn their emotions (and there are plenty of emotions in this album) to the relevant music. Near the end of this song, a sudden shout is heard. Dry and oh so painful to the throat, this painful growl shows a glimpse of the band’s ability to venture into more extreme regions of music. As I understand they have the ability to get much angrier and dirtier than they appear, I find it easy to understand their choices of musical tastes. They prove that they are nice, but they can become monsters if need be. Maybe not monsters, but deviants, surely.